UPDATE 8pm: POLICE have charged a man who allegedly entered a business in Paget this morning with a handgun. Police will allege officers were called to a Caterpillar Drive business about 10.20am after reports an armed man attended, threatened the manager and was holding him in the office. Police negotiators spoke with the man and after about 20 minutes the employee was released. The man then surrendered without further incident. The employee was not physically injured. A 61-year-old Carmilla man has been charged with one count each of dangerous conduct with a weapon (replica handgun) and deprivation of liberty. 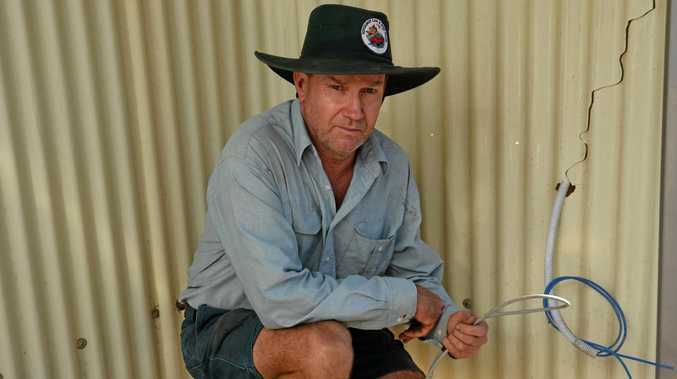 He will appear at the Mackay Magistrates Court on Tuesday. 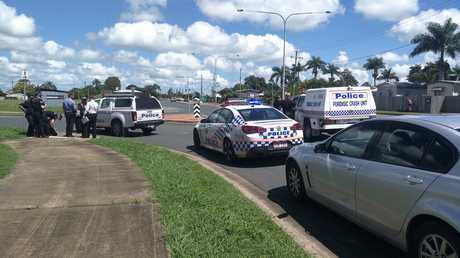 UPDATE 2.45PM: AFTER a tense 40 minute stand-off police took a 57-year-old man into custody after he allegedly took a handgun into a Paget business. Businesses at Caterpillar Drive were sent into lock-down, and employees evacuated the building when the allegedly armed man arrived at the office of Global Food and Wine Distribution and asked to speak to the manager at 10.20am. Police in bullet-proof vests set up two exclusion zones, while the armed man was reportedly in the front office of the business with the manager. Carl Lemura, a worker at a neighbouring business said "police ran in and told us to close the doors. We were told to lock down." He said four police officers inside the building were able to negotiate with the 57-year old man. Snr Sgt Sheridan said police were able to quickly talk the armed man down, and he disarmed himself and was taken into custody. Police would not disclose the man's identity or his relationship with the business. Snr Sgt Sheridan said "we are making inquiries as to his identity and what brought him here to this premises. He could be a former employee, but we have to ascertain that in due course as part of the investigation." Snr Sgt Sheridan confirmed no shots were fired. Police would not confirm if the handgun was loaded. Snr Sgt Sheridan said police were unsure if it was "capable of being discharged". Police could not reveal much more information about what occurred in those 40 minutes of lock-down. Snr Sgt Sheridan said more information would be revealed in due course. "We will find the real reasons for what actually happened," he said. The Mackay Criminal Investigaion Branch are now conducting inquiries. UPDATE 11.22am: POLICE are now leaving the scene and staff are returning to the business. Officers are expected to take the man to Mackay Watchhouse for further questioning. UPDATE 11.05AM: SCENES of Crime crews have been called to attend the scene. Police have revoked the exclusion zone and are reopening Caterpillar Drive to traffic. The armed man who sparked the stand-off has been taken into custody. All staff at the business are safe. UPDATE 11AM: POLICE have taken a man armed with a gun into custody. No one has reportedly been injured in the incident. 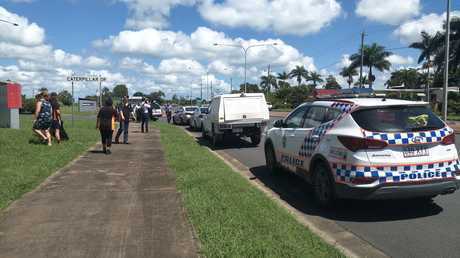 UPDATE 10.50AM: DETECTIVES from Mackay CIB have arrived at the scene of a developing siege situation at Paget. Police have blocked access to Caterpillar Drive at Paget via both Farrellys Road the Turbo Drive. The man remains inside the business, which has been identified as Global Food & Wine Distribution, armed with a handgun. Police are continuing to negotiate with the man, who is understood to be an ex-employee of the business. UPDATE 10.40AM: POLICE are blocking access to Caterpillar Drive at Paget as negotiations with a man armed with a gun continue. Daily Mercury reporters at the scene say seven police cars are on scene and have blocked access via Farrellys Road. The man has taken hostages. Six employees are waiting in an exclusion zone outside the business and Queensland Ambulance Service have arrived on scene. BREAKING 10.30AM: MULTIPLE police crews are responding to a reports of an armed man at a Paget business. Initial reports indicate a man with white hair and a white beard has presented at a business on Caterpillar Drive armed with a handgun. The man is reportedly in the front office of the business with the manager. All other employees are evacuating. Police crews are reportedly 'vesting up' on their way to the incident.